RVA – 48 HOURS LEFT to purchase NEW MEDIA SEMINARS tickets for 3/10! 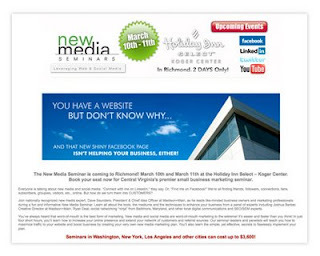 For our AdvertisingandNewMedia.com readers, we are extending a special 2-for-1 offer for the New Media Seminar on 3/10. Go to http://www.newmediaseminars.com/mmpromo to purchase securely online. The new media seminar will teach you online methods and strategies to attract more customers, form ongoing connections with your existing customers and keep ahead of the competition. There are so many ways to connect: blogging, social networking, content sharing and promotion. And it’s easier than you think!